The body of a Northwestern University student missing since early Saturday morning was recovered Thursday evening from Lake Michigan's Wilmette Harbor. The body of Northwestern University student Harsha Maddula, who was missing since early Saturday morning, was recovered Thursday evening from Wilmette Harbor. Harsha Maddula, 18, vanished after leaving a party near his campus residence hall early Saturday morning. While there's been no official confirmation of identity, university spokesman Alan Cubbage said Maddula's identification and cell phone were found on the body that was pulled from the water near the bridge on Sheridan Road shortly before 7 p.m.
Cubbage said there does not appear to be any foul play involved. "On behalf of Northwestern University, I extend our deepest sympathies to Harsha's family and to his many friends at Northwestern. Our hearts and thoughts are with them," said University President Morton Schapiro. "The loss of one member of the Northwestern community deeply affects us all." The discovery ends days of searching by hundreds of volunteers, including family, friends, students and community members. Maddula's family members on Wednesday put up a $25,000 reward for information as the search expanded to the waters of Lake Michigan near his residence hall. Authorities said the last "ping" from his cell phone hit a tower near the water. 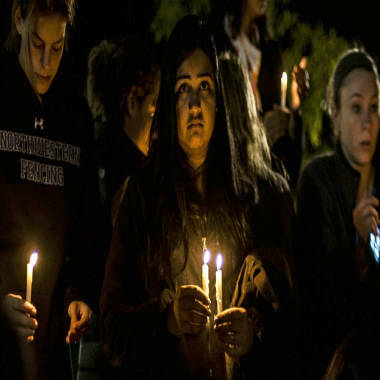 Students at Northwestern University hold a candelight vigil for fellow student Harsha Maddula who went missing early Saturday morning and was found dead Thursday night. "It is believed that the cell phone that was found on the body, that the amount of time it took for the various signals to go on northward, that is consistent with someone walking," said Cubbage. Dive teams searching the water on Wednesday turned up nothing, but Maddula's family said earlier in the day that their spirits were lifted by word from relatives in India who'd contacted psychics. "All my family and friends from India, from everywhere, they see me on TV and they say, 'He's still alive. Don't worry,'" his father, Prasad Maddula, told reporters. "Why the body was found today and not yesterday during the extensive search that occurred, I don't know the answer," said Cubbage. A Facebook page dedicated to updates on the search for Maddula was apparently taken offline Thursday evening.